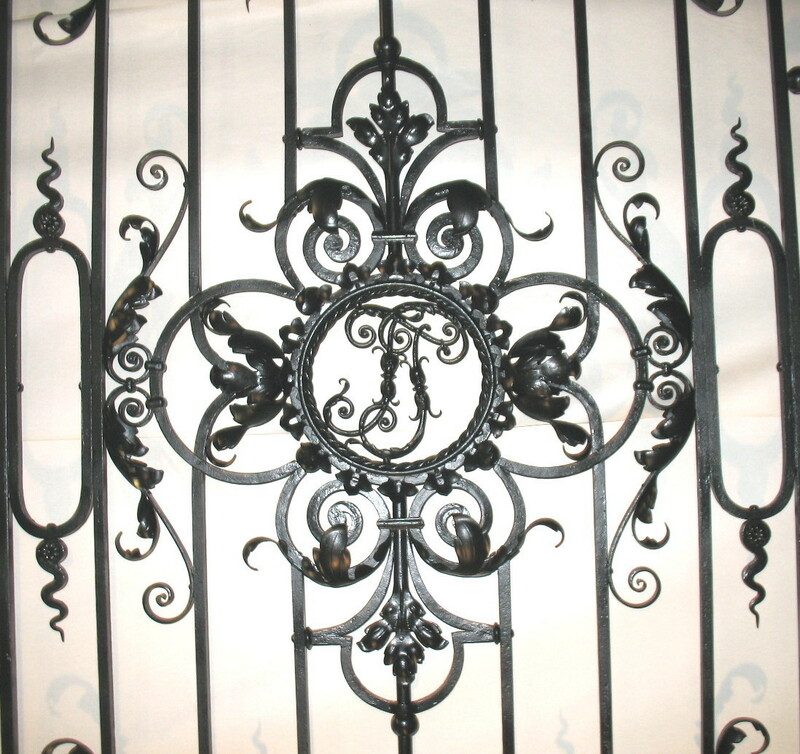 In 2008, I had the privilege to restore a very large window grille made by master blacksmith Cyril Colnik. 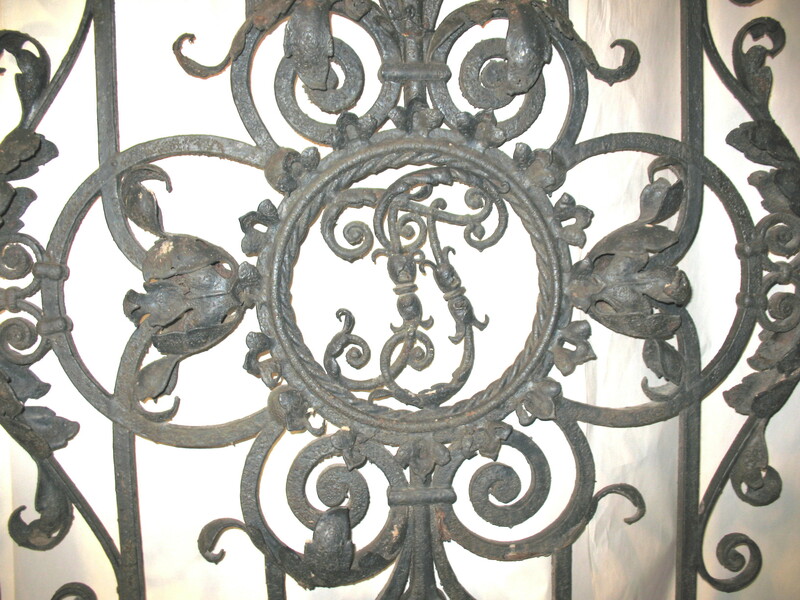 The grille belongs to the “Captain Frederick Pabst Mansion” and is situated on the northern exterior of the building. 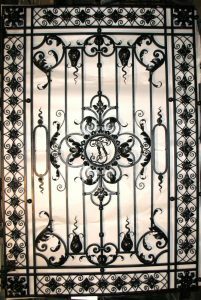 It measures 66″ x 99″. 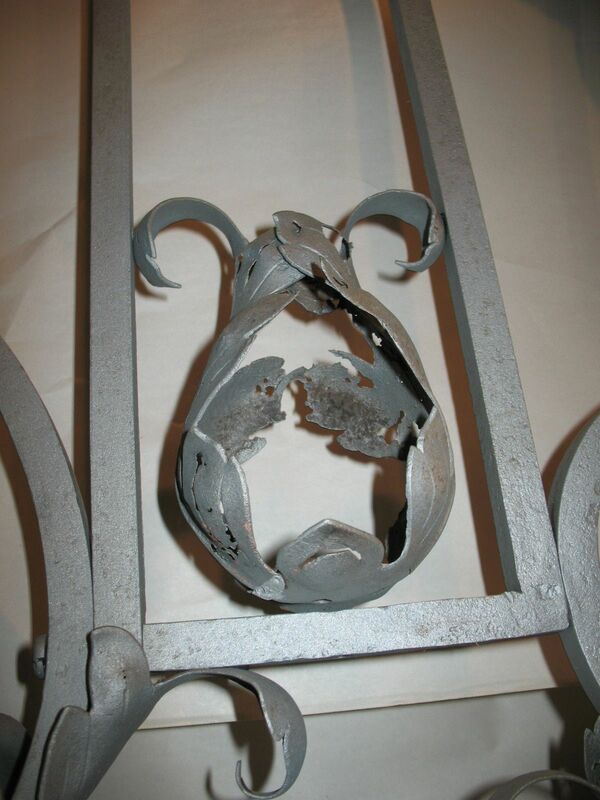 The approximate age of the grille is 100 years old, and it was literally falling apart. 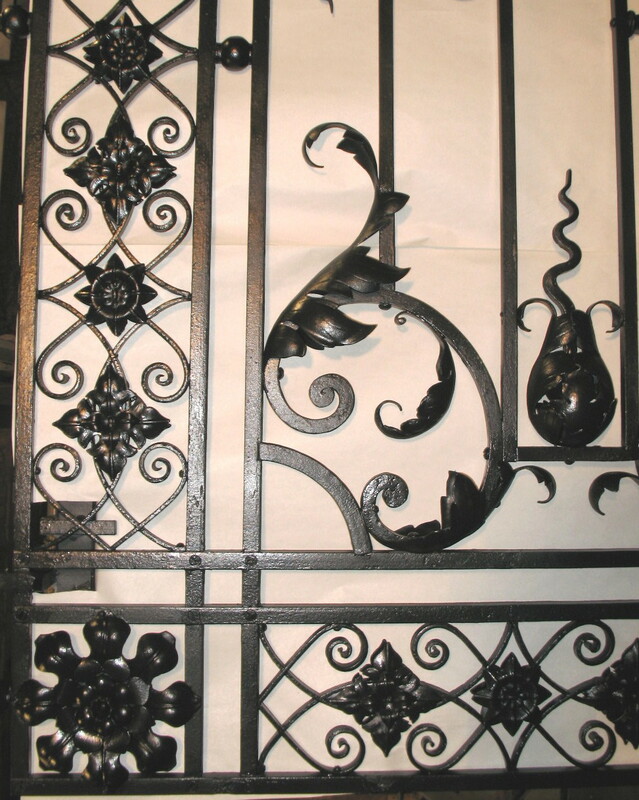 Restoration provides a window to the processes used by the masters of yesteryear. This was no exception. Below are some close-ups of specific areas, before, and after. Center after sandblasting, revealing more corrosion. View of center after restoration. The twisted wreath in the center was held in place by friction, which was surprising. Note that many of the leaves of the wreath were missing. You may have been caught by surprise to see the copper leaves, and the bronze collars. Below shows a close-up of a collar. 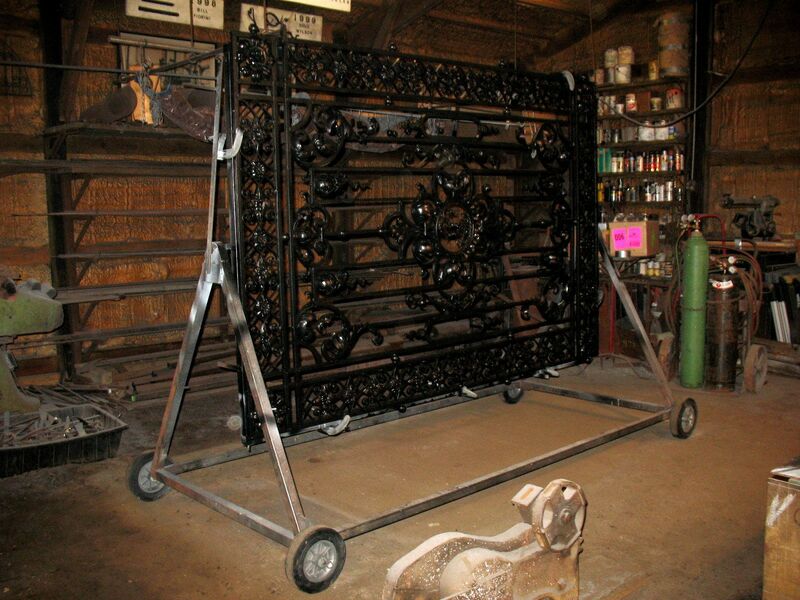 Notice that it is riveted together, then finish-filed. The next images are of the lower right corner, before, and after. Notice the corner rosette….or lack thereof. Below are the “before and after” images of the lower left corner. Notice the missing rosettes on the perimeter. The perimeter rosettes were actually comprised of four pieces, two on the front of the grille, and two on the back. The originals were all stamped, rather than being made individually by hand. 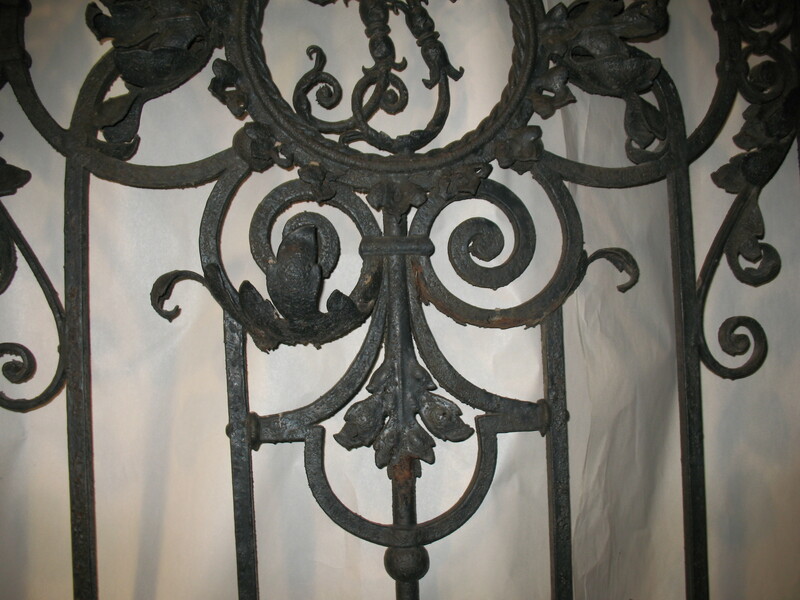 The intent was to save as much of the repoussé leaves, and the stamped rosettes as possible. 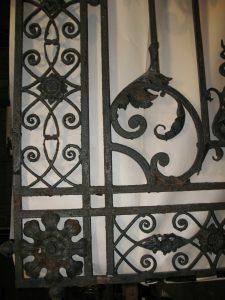 Upon closer inspection, it was apparent none of the stampings could be salvaged, as many were literally being held together by paint. They were all removed. 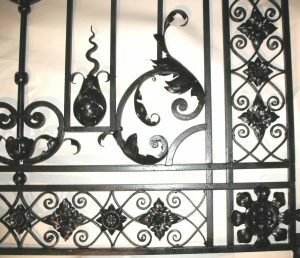 After sandblasting, only the large, two corner rosettes on the top of the grille and three other leaves in the mid-section could be saved. Some leaves and rosettes were missing entirely. Here are some more images, showing the decay of the piece. Below shows where a calyx once resided. 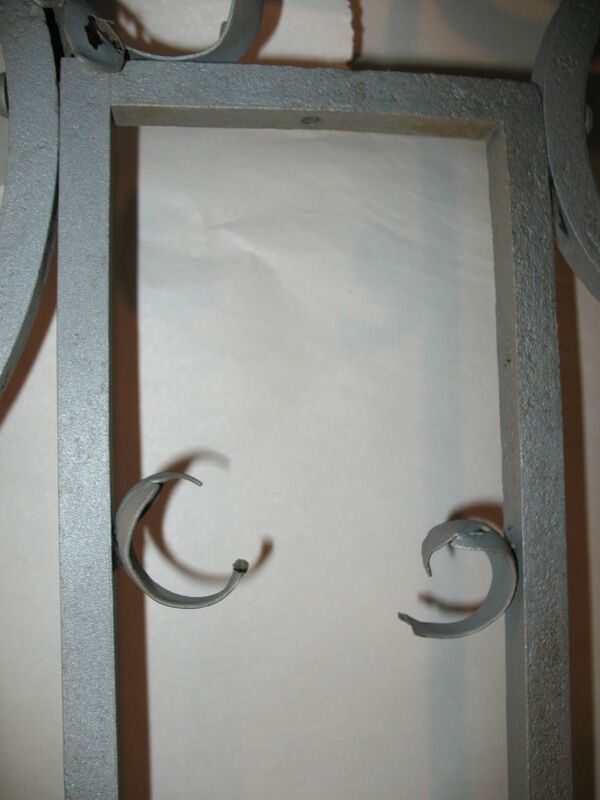 This image was taken after sandblasting. 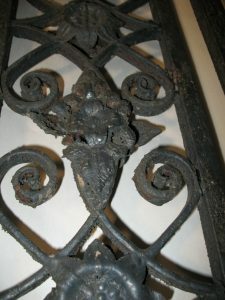 The next image shows missing leaf lobes just below the middle of the grille. Many of the leaves were so far gone, that you could poke a finger right through them. 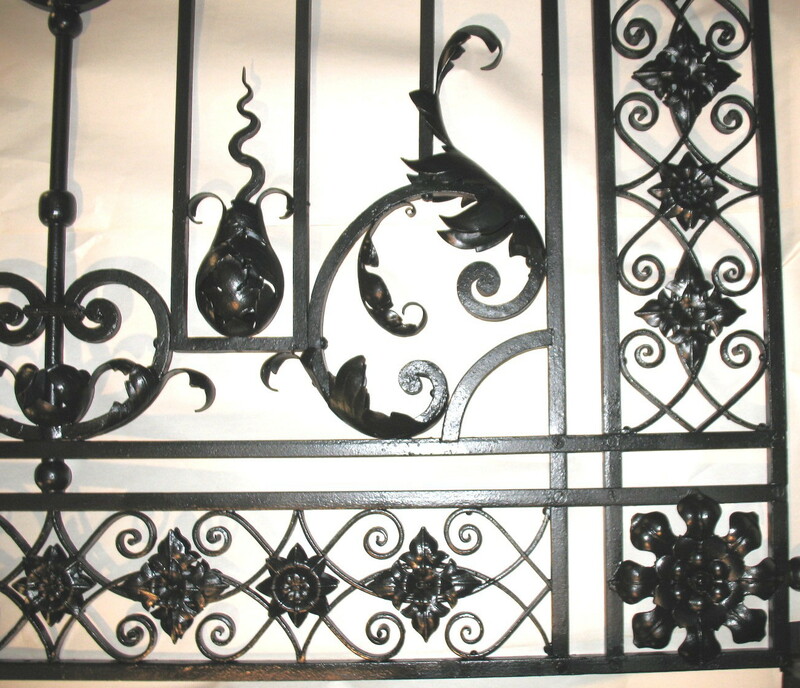 The grille was entirely disassembled in the middle, in-between the bars that contained the perimeter rosettes. 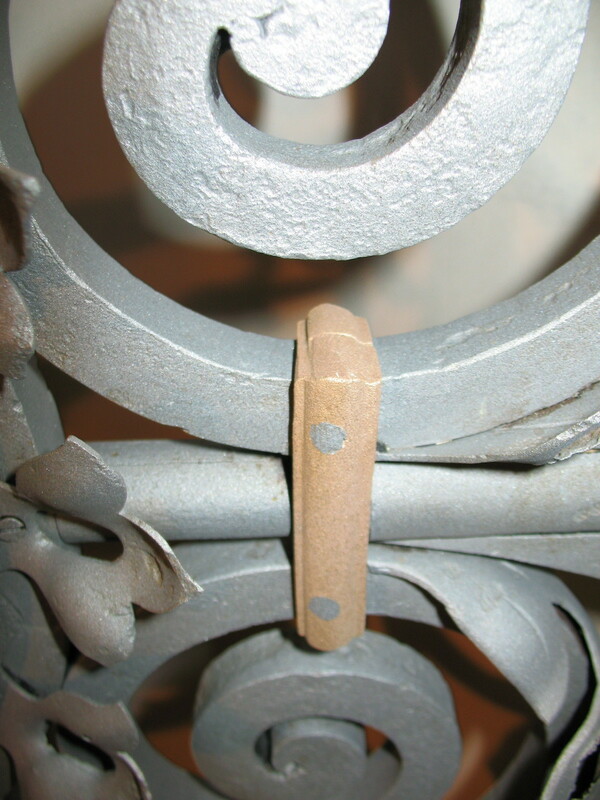 Fortunately, Colnik employed the use of screws for most of the joinery, plus some rivets and a few collars. This made disassembly easier. Unfortunately, many of the screws were stripped or bent, and required heat to extract. 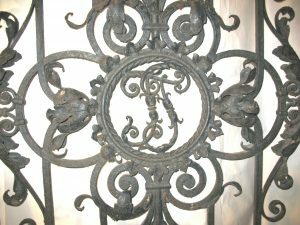 Once disassembled and labeled, patterns were made from the best (that is a relative term) of what was left of the repoussé leaves. 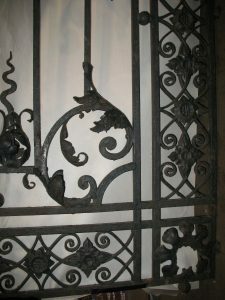 The original leaves were initially stretched (merely by the process of shaping) when they were made, and were stretched again when flattened out to make the patterns. With trial and error, I found that they had grown (stretched) an average of 8%. Photo copies were made of the patterns, and were then reduced accordingly. Below is a calyx (or husk) after sandblasting. Note that not only is there a degree of decay, but some leaves were missing entirely. The successive image shows the reproduction. Each leaf was cut by hand, and formed over stakes, using the French method of repoussé. Note that there is not much detail in the leaves. There are no raised veins, and little surface detail. 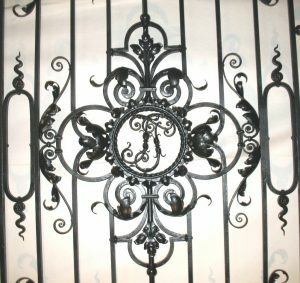 This is largely due to the fact that the grille is so massive, and mounted at a height where such details would not be seen or admired. In other words, such details would go unnoticed. The perimeter rosettes were another matter, as there were so many of them. 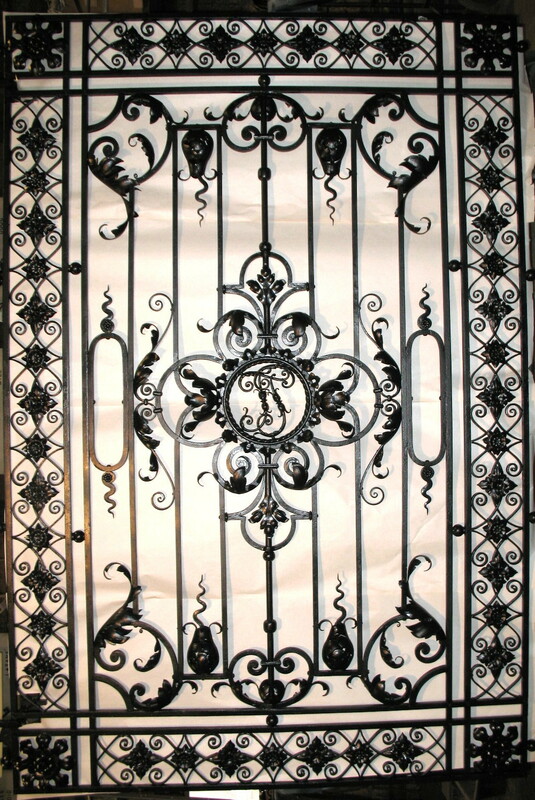 Patterns were made as described above, and were cut-out by laser. 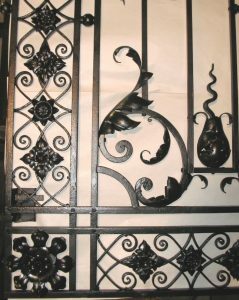 The surface details were then applied by hand with punches and chisels. Next, a fly press was used to initially dish them out. A fly press is a very powerful manual press that uses a worm screw to slowly lower the ram in a controlled manner. These rosettes were mounted in a fashion which I have never seen before. Remember, there are two rosettes on each side of the mounting bars, (a small rosette and a larger rosette on each side.) Each rosette has two 3/16″ mounting holes, just off center, so a half-round 3/16″ staple could be inserted. 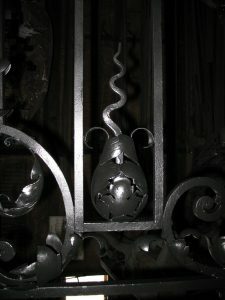 The staple then passes around the bars to which the rosettes attach, and then through the rosettes on the other side. The staple is then clinched over to lock all four rosettes into place. It was surprising at how effective the staples were in locking things together. The 3/16″ half round stock had to be made for the staples. 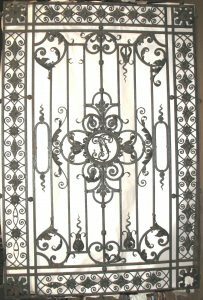 This was done by making a 3/16″ swedge, which is a bottom die with a 3/16″ radias in it. 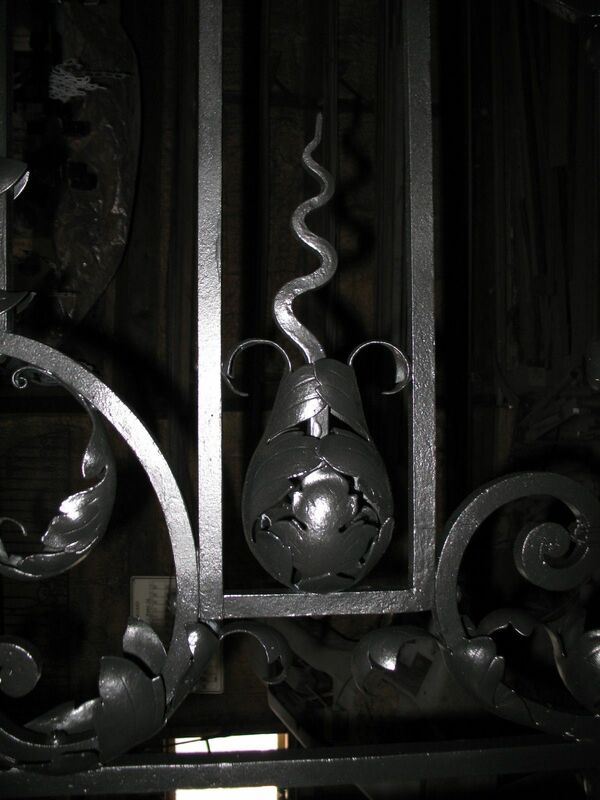 A hot 1/8″ bar was placed on top of the swedge, and was then forged down into the swedge with the power hammer. The flashing, (or excess metal,) was then filed away. I thought long and hard as to how I would hold and manipulate the grille in a one man shop. 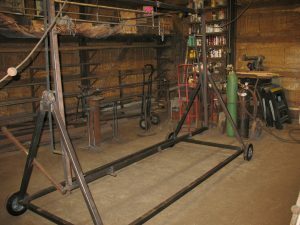 Below are three images showing a mounting frame that I made that swivels 360 degrees, and can be locked into several positions for easy access to the grille. This made the work much easier. 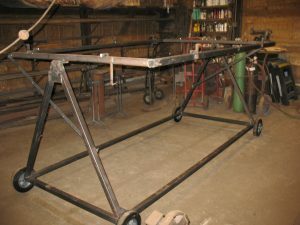 The frame could also be used to safely pick the grille up off the ground by use of two hooks on the top. This required four grown men (friends) to use the leverage of the rotating frame by pushing down on one side of the frame, thereby hoisting the piece up and into position. The frame was also employed for transport, and for sandblasting. 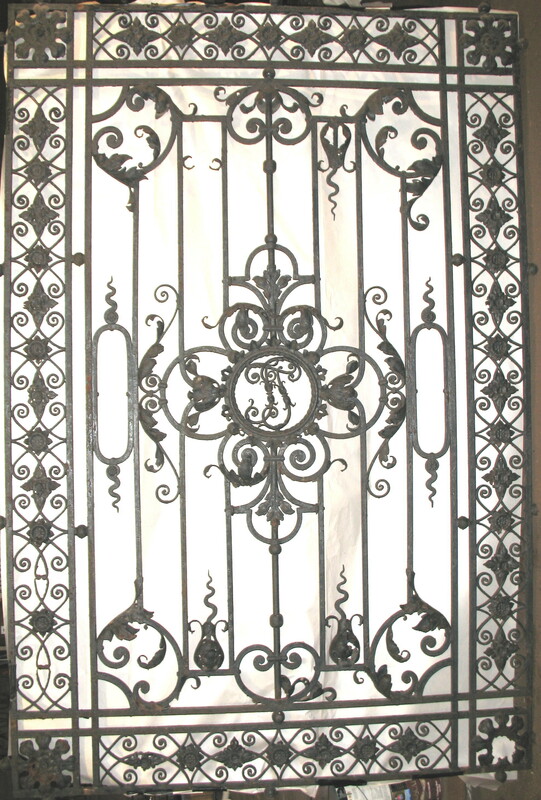 The image below shows the grille in the frame. Many of the tapped holes needed retapping, and most all of the screws were replaced. Painting was no small task. Initially the grille was spray painted, but two days of hand painting was required to paint where the spray could not reach. Bright lights were used to see into the many recesses. Using two different color primers helped to show where paint needed to be applied. The project went back together almost without a hitch. Hopefully, it will be sound for another 100 years, if maintenance is provided regularly. 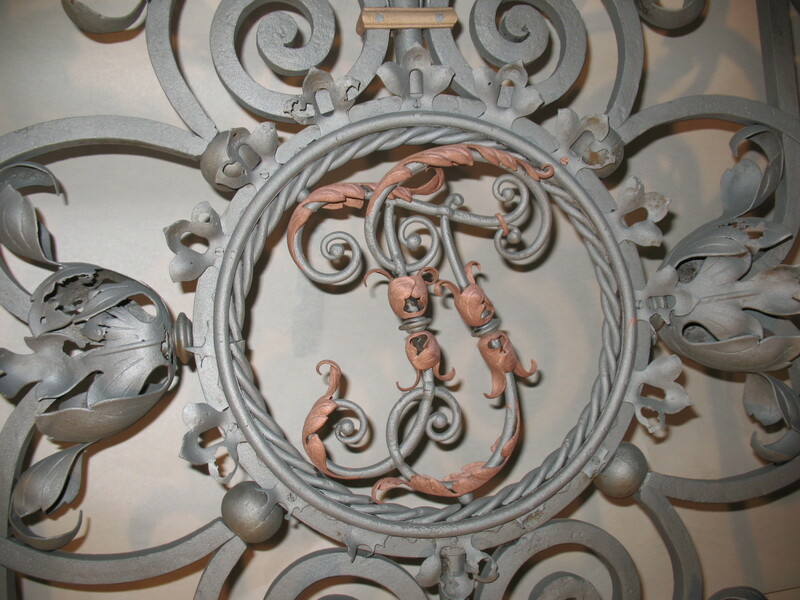 I thank the folks at the Captain Frederick Pabst Mansion for entrusting me with this project. “You’ll never have any mental muscle if you don’t have any heavy stuff to pick up.”……Diane Lane, actress.